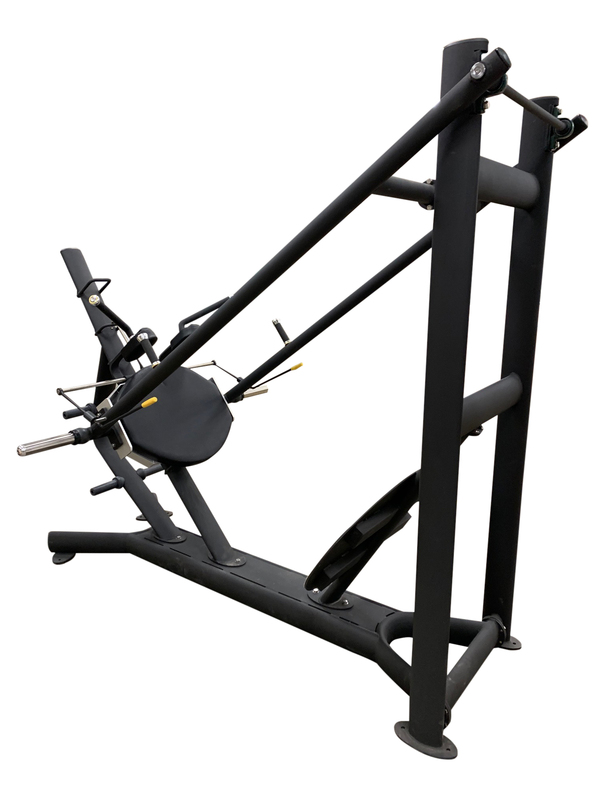 A biomechanically superior, plate loaded leg machine that allows you to perform deep, full range squats, without loading the spine or placing undue pressure on the knees. The patented curved trajectory allows for properly varying resistance that makes squatting safer, more comfortable and more effective. 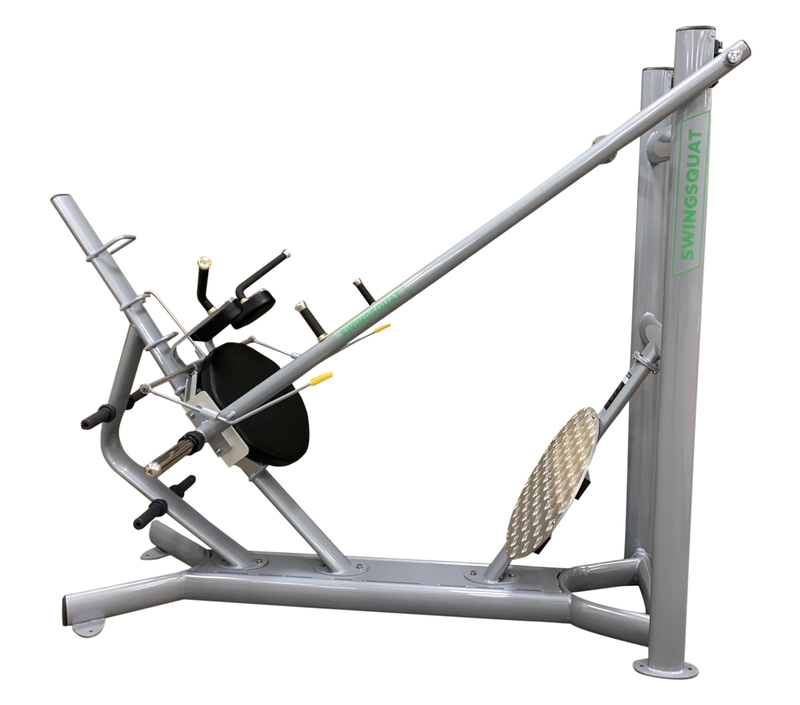 These unique features provide “state of the art” advantages that cannot be found in any other leg exercise apparatus, at any price. Our mission is to get the swingsquat into every gym and fitness facility in the usa. Pivotally displaceable aluminum carriage with automatic release hookbar. Conveniently placed manually operable levers. Easily and readily re-engageable onto any of the 6 equally accessible rungs. Large non-skid inclined platform provides for varying foot positions. Two handgrip positions on connecting beams and upper handles. on shoulder pad frame. Properly varying resistance throughout the curved trajectory. Carriage slight lateral play enhances the “real feel” squat movement. Can load up to 540lbs. Protects your back because your body is more recumbent during the lower, otherwise more vulnerable half of the exercise. Protects and stabilizes your knees by enabling your lower legs and upper body to be parallel to each other during the lower half of the exercise. “LEG squats” means that you will feel your quads working like never before – without endangering your knees or lower back. The carriage releases automatically and is easily and safely rackable. And its slight lateral “play” only enhances how smooth and how natural the Machine already feels. 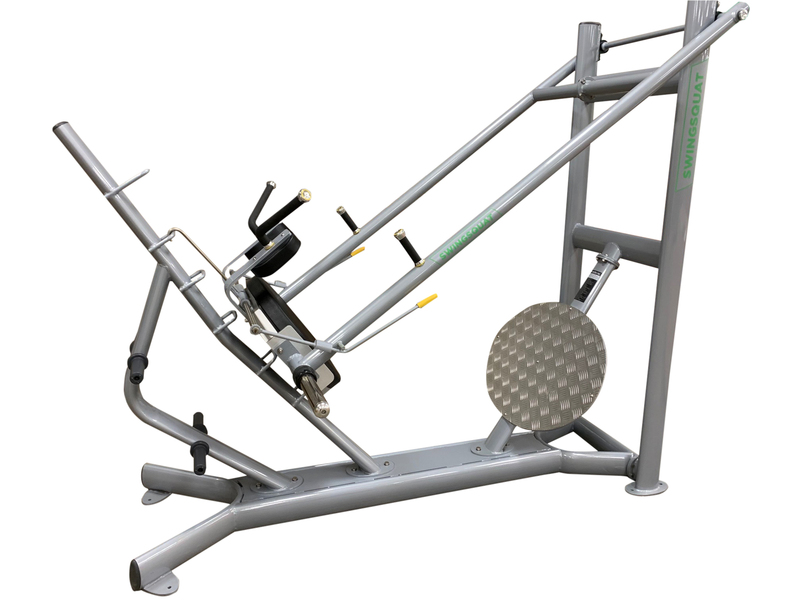 If you were to become stuck at or near the bottom of your last rep, the carriage is also rackable onto either of the bent channel’s lowest rungs. Now you can train alone in complete safety! Safety, comfort, state-of-the-art biomechanics: The Swingsquat has them all! We are dedicated to providing it to every gym and exercise facility in the U.S.A that cares to provide the safest, most effective leg exercise for its members, clients, students, athletes and/or sports teams. Think of all the backs – and twice as many KNEES! – that will never be injured!
" I can't believe it! I don't feel my knees! This is a miracle machine!" 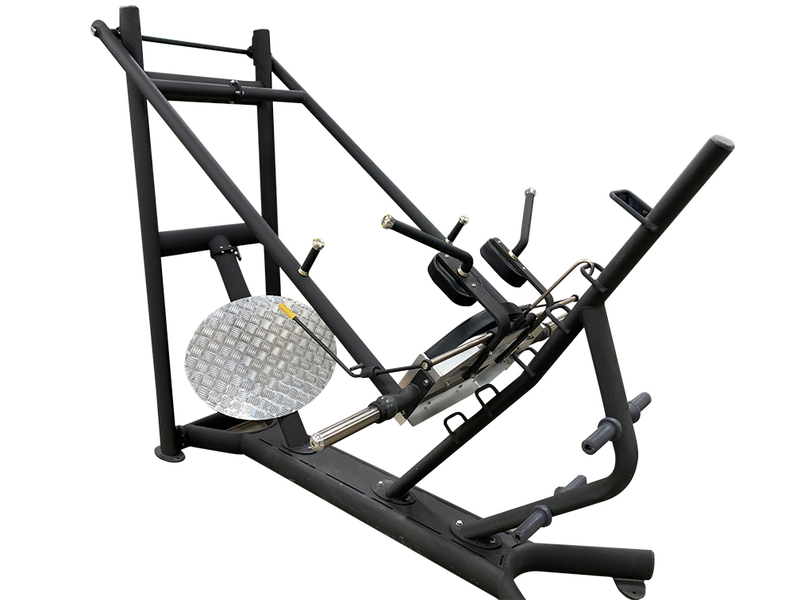 "Its function is better than any other kind of Squat Machine I know of on the market." "People who did not squat for various reason (dislike, fear, injury, etc.) now not only have an alternative but actually a superior exercise. All the anabolics without fear or injury!" "Wow, what a great pump and burn with no back and knee pain. Little did I know after purchasing one for my gym that it would be the most talked and raved about piece of equipment in the gym. 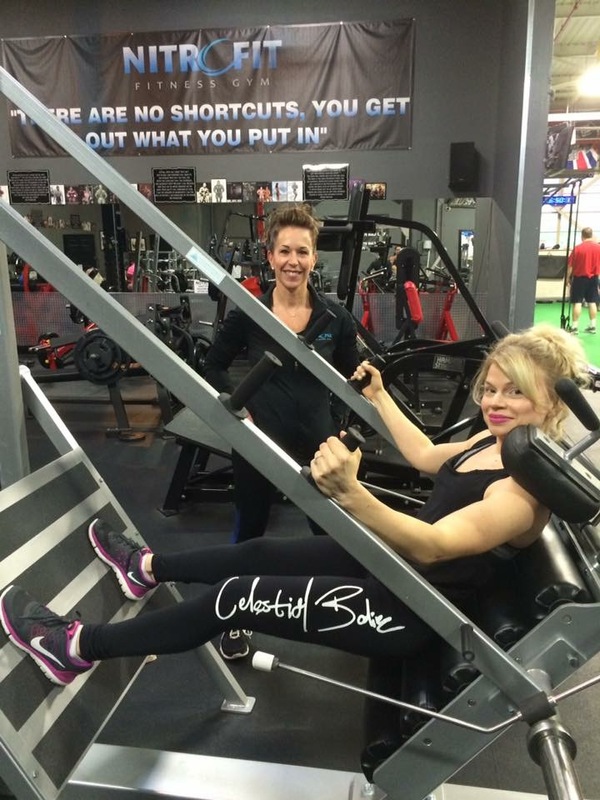 I've actually picked up new members who trained at other gyms, the deciding factor being your Leg Machine!" "In over 30 years as a participant in the fitness industry as both a trainer of some of the top amateur and professional athletes in the world, I have never seen a better/safer pure leg motion than the one provided by your machine." 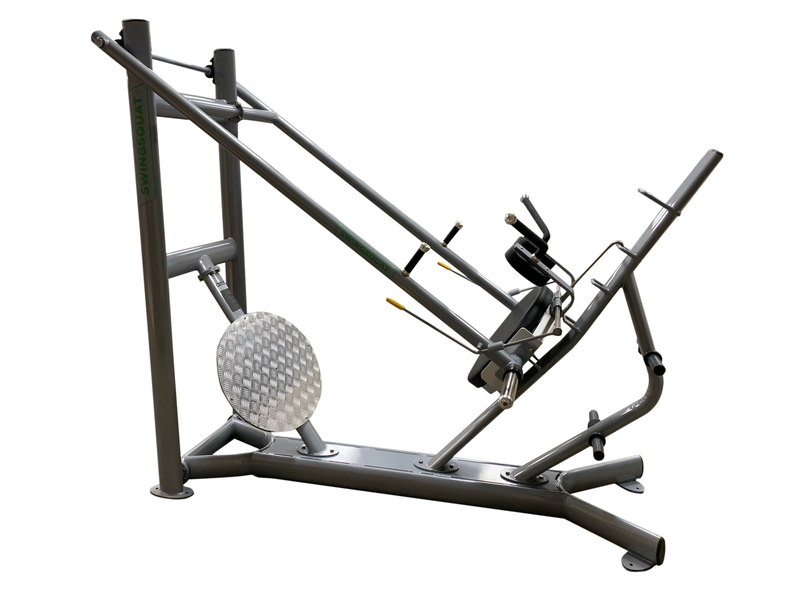 Randy Coyle invented the first version of the swing squat back in 1979 (US Patent #5,626,548) and since revised the machine in 1997 with a new patent. Unfortunately, many of the larger equipment manufacturing companies infringed on Randy`s patent and started producing knockoff`s of Randy`s original design. Without the funds required to retain a copyright attorney, Randy had to sit back and watch his invention get copied and not get the recognition he justly deserved for his revolutionary leg machine. The other versions aren’t a touch on the original and Randy, to this day, at 80 years old, still manufactures and produces Swingsquat machines. As you can see, the testimonials speak for themselves and the original Swingsquat is still the KING of the leg machines.